Gooseberry Farm is our very happy and busy croft high atop a hill in the heart of the Shenandoah Valley of Virginia. We have made our home here for nearly 30 years. As we have, since 1991, we continue to breed and raise Registered Shetland Sheep in many colors and patterns, including newer AI genetics, imported from Shetland. Our Shetlands continue to provide the magnificent Shetland fleeces that are made into our lovely yarns. Searching for a very sheepy American conservation project, we added the very critically endangered CVM/Romeldale Sheep to our farm several years ago. It was a wonderful decision! Their wool is exquisitely soft and suitable for wearing next to the skin. Their delicious fleeces, in a range of natural colours, are also made into our yarns and occasionally into rovings for hand spinning. Believing that all of our lives are magnificently pieced together with many yarns, threads and fabrics, we have partnered with the legendary Valdani, Inc., to provide their gorgeous hand dyed, colorfast threads. Soon, we will have available knitting needles & tools as well as patterns well suited to our wools. Thank you for stopping by to visit! Stay awhile! Romeldale Sheep are the most critically rare of all the rare breeds of sheep in the U.S. today accoring to the American Livestock Breeds Conservancy. The California Variegated Mutant, or CVM, is a mutation of the Romeldale sheep, a dual purpose breed developed by A. T. Spencer in the early 1900’s. Mr. Spencer crossed New Zealand Romney rams with his Rambouillet ewes to increase the staple and length of fleece and to improve the carcass quality. Through many years of selective breeding, the American Romeldale breed was developed. 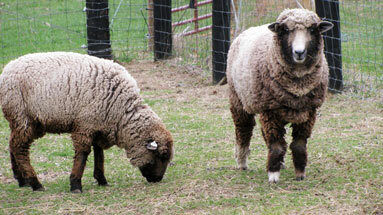 During the 1960’s, Glen Eidman found a multi-colored ewe lamb in his purebred Romeldale flock. Two years later, a ram lamb with the same coloration pattern was born. When the ewe and ram were crossed, the resulting offspring also had this unique color pattern. Through subsequent breeding and further mutations, the CVM breed was developed over a 15 year period. During that time, Mr. Eidman did not sell any of the CVM sheep so as to have complete control over the breeding. In 1982, the entire flock was dispersed. There are fewer than 20 breeders in the country today. Romeldale/CVM sheep are perhaps the best choice for small farms because they have wonderful wool, produce a good carcass, and thrive in even the most extreme weather. This breed does not require a lot of heavy maintance, and they were bred to be resistant to many of the problems that plague other breeds. From the Viking settlers of a thousand years ago, who brought these hardy sheep with them to the Shetland Islands, Shetland Sheep are small and easy to manage, adaptable, easy lambers, good mothers, thrifty and long-lived. They are usually calm and docile, responding well to attention (not to mention affection). Tail wagging is a common trait among these friendly sheep! Rams are handsome creatures with large spiraled or c-shaped horns. Horns make great handles for these guys who weigh 90-125 lbs. Rams are usually friendly and curious, though you should always be observant when dealing with rams. Ewes are often sweet and friendly, weighing 75-100 lbs. They are usually polled. 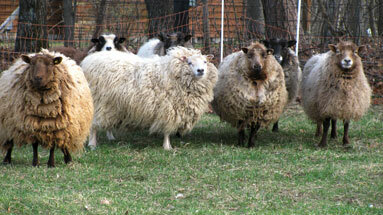 All Shetlands have a short fluke-shaped tail that never needs docking. Shetland Sheep are perfect for smaller acreages and facilities, perfect for the smaller shepherd or the shepherd worn out from wrestling big sheep, perfect for children and family projects, perfect for pasture management, and perfect for a spinner’s flock.